Intel executives have conceded that they still haven’t caught up with Qualcomm in designing processors for smartphones and tablets. But with new “SoFIA” Atom X3 systems-on-a-chip (SoCs), along with the new “Cherry Trail” Atom X5 and X7, Intel’s getting closer. Although all three products share the Atom name, they really represent two different product families. Intel’s Atom X3 is Intel’s best hope for the smartphone market, as the SoC contains an integrated 3G radio along with an application processor. Both the X5 and X7 are more conventional Atom processors, lack an integrated radio, and will appear in larger, more powerful tablets. While Intel is eager to discuss the performance of the new chips, there are still significant questions concerning how customers will accept them. Intel declined to discuss the Atom X3’s power consumption, but said the chip will ship into the cheapest of smartphones. As for the new 14-nm “Cherry Trail” Atom X5 and Atom X7 chips, they’ll consume roughly the same amount of power as their “Bay Trail” predecessors—which were manufactured in an older, less efficient 22-nm process. Tablets like this Dell Venue 8 (or its successor) would be ideal for Intel’s new Atom chips. Intel executives spoke to reporters ahead of Mobile World Congress in Barcelona, perhaps the most important smartphone show in the world. Still, Intel’s playing the long game. The company can afford to bide its time and fine-tune its products to what its customers want, allowing the continuing success of its enterprise division to fund innovation. Intel says that its Atom X3 3G chips will ship into phones selling for less than $75 (think emerging markets), while its more powerful versions will appear in the “value” phone segment, at up to $200 in retail pricing. Intel named several partners that are working with the Atom X3: Besides Asus, mostly all of them are smaller companies or original device makers for other companies, such as ECS, Pegatron, Compal, and Wistron. Lenovo, which designed an earlier phone around Intel’s chips, is missing from Intel’s line-up. 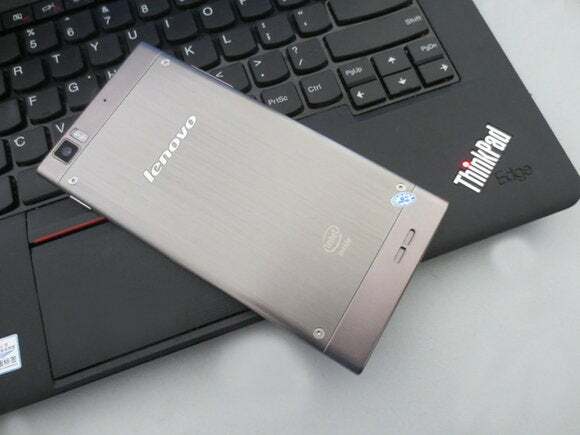 The Lenovo K900, designed around an earlier Intel Atom chip. Intel’s Atom X3-C3130 chip, originally code-named SoFIA, will be available as three products: the first, integrated with a 3G radio, has begun shipping, Evans said. A second, slightly more powerful version (also known as the 3G-R or X3-C3230RK), will be made by Intel’s licensing partner, Rockchip, and is due later in the first half. Although the 3G and 3G-R chips will only support Android, the LTE chip, timed to coincide with the release of Windows 10, will support Windows 10 phones as well, Evans said. How Intel’s new Atom X3 or “Sofia” chip breaks down. In 2014, Intel was faced with the daunting task of trying to grow market share in the tablet market, setting a goal of selling chips into 40 million tablets. Intel accomplished that task, but essentially bought its way into the market, using a technique it euphemistically called “contra revenue” to pay tablet makers to use its chips. In September, Intel chief executive Brian Krzanich said that the company has set a numerical smartphone target for 2015, but “would really like to avoid” using contra revenue to achieve it. Evans confirmed that, saying that contra revenue was originally a “very calculated move” to enter the market. Intel is trying to move beyond that, “trying to get to a point where we don’t have to automatically offer contra revenue to offset some of the [bill of materials] costs that we have,” she said. But, she added, contra revenue might still be used in small amounts. Intel’s Atom X3 benchmarks predict great things against Qualcomm’s current chips. Performance, however, is where Intel hopes its new chips will shine. Intel’s own estimates say that the Atom X3 3G should be 1.5 times faster than the Qualcomm MSM8212 in terms of the MobileXPRT benchmark, measuring light media editing like applying filters. The 3G-R version should bump that to 1.8 times the Qualcomm chip, the company said. Likewise, the new Atom X5 and X7 should offer substantial performance benefits. The Atom X7, for example, should be twice as powerful as the prior “Bay Trail” in the GFXBench T-Rex HD (offscreen) benchmark, and 50 percent faster in the 3DMark Ice Storm benchmark, Intel said. Again, however, Evans declined to release any power metrics for the two new chips. For Intel’s new “Cherry Trail” Atom chips, potential customers include a who’s who of industry heavyweights: Asus, Acer, Dell, HP, Lenovo, and Toshiba, with the notable exception of Samsung. 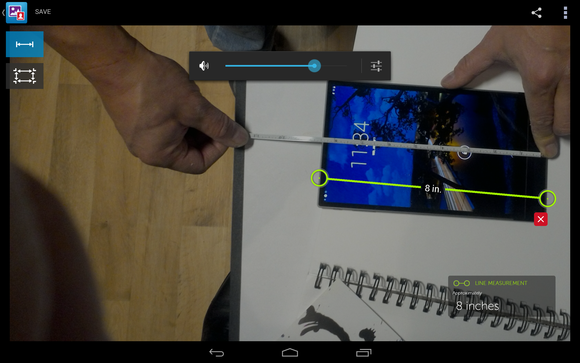 Intel’s RealSense cameras can provide nifty effects like real-world distance measurements. But here, too, Intel said that customers should focus on performance, rather than power. Josh Newman, the general manager of tablets and 2-in-1 devices for Intel, said that the the new Cherry Trail chips should have “significant improvement in graphics, gen[eration] on gen[eration], with some of the significant user experiences that I talked about.” Meanwhile, Newman said, power consumption will be roughly equivalent to prior-generation Bay Trail chips. That’s somewhat surprising, given that the Bay Trail parts were fabricated at 22-nm, and the Cherry Trail Atom X5 and X7 are 14-nm chips. Newman’s “user experiences,” however, include the RealSense depth cameras that Intel began talking about last year, where the CPU is used for fun effects such as “refocusing” the camera after the shot and calculating the length of objects in the scene. Intel’s TrueKey security and Pro WiDi technologies could also appear. 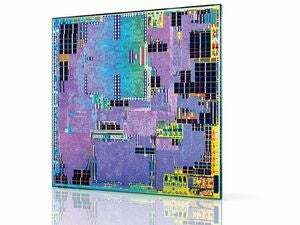 Hardware makers that buy Intel’s parts could also design 3G tablets. Intel will show off separate LTE/Bluetooth/WiFi radios, known as its AC 8X70, together with its GNSSS 2x00 GPS chip and NFC 4000 NFC controller. Still, the new Atoms represent a notable achievement for Intel, which hasn’t made a viable run at the smartphone market since 1999’s StrongARM processor. Will it be able to exploit the niche? Time will tell.